OBJECTIVE To review the management of bariatric surgical patients. QUALITY OF EVIDENCE MEDLINE, EMBASE, and Cochrane Library databases were searched, as well as PubMed US National Library, from January 1950 to December 2009. Evidence was levels I, II, and III. MAIN MESSAGE Bariatric surgery should be considered for obese patients at high risk of morbidity and mortality who have not achieved adequate weight loss with lifestyle and medical management and who are suffering from the complications of obesity. Bariatric surgery can result in substantial weight loss, resolution of comorbid conditions, and improved quality of life. The patient’s weight-loss history; his or her personal accountability, responsibility, and comprehension; and the acceptable level of risk must be taken into account. Complications include technical failure, bleeding, abdominal pain, nausea or vomiting, excess loose skin, bowel obstruction, ulcers, and anastomotic stricture. Lifelong monitoring by a multidisciplinary team is essential. CONCLUSION Limited long-term success of behavioural and pharmacologic therapies in severe obesity has led to renewed interest in bariatric surgery. Success with bariatric surgery is more likely when multidisciplinary care providers, in conjunction with primary care providers, assess, treat, monitor, and evaluate patients before and after surgery. Family physicians will play a critical role in counseling patients about bariatric surgery and will need to develop skills in managing these patients in the long-term. The limited long-term success of behavioural and pharmacological therapies in patients with severe obesity has led to a renewed interest in bariatric (obesity) surgery in Canada.5 Currently, several provinces are attempting to improve access to bariatric surgery programs. In the near future it is anticipated that more than 4000 to 5000 patients will undergo bariatric surgery in Canada; as such, family physicians will play a critical role in counseling patients regarding the need for bariatric surgery and will need to develop skills in managing these patients in the long-term. The aim of this review is to inform family doctors about some of the key issues relevant to the management of bariatric surgical patients. We performed an electronic literature search of MEDLINE, EMBASE, and Cochrane Library databases, as well as the PubMed US National Library, from January 1950 to December 2010. We used the search terms bariatric surgery, obesity surgery, gastric band, gastric bypass, sleeve gastrectomy, and gastroplasty in combination with weight gain or weight loss or nutrition. Studies were limited to the English language, adult populations, and human subjects. Google was also used to search for gray literature. We defined our inclusion criteria as randomized controlled trials, meta-analyses, case reports, non-randomized control trials, reviews, and retrospective and prospective case series. Studies only reporting surgical techniques or without follow-up outcomes were excluded. Evidence was levels I, II, and III. The individual needs to demonstrate adherence to recommendations by attending appointments, practising self-monitoring with record-keeping, making time for healthy eating and activity, taking medication, and completing bloodwork. The individual must have an understanding of the benefits and limitations of a surgical procedure to assist with management of his or her obesity. Box 16–9 shows exclusion criteria for patients who should not be offered bariatric surgery. 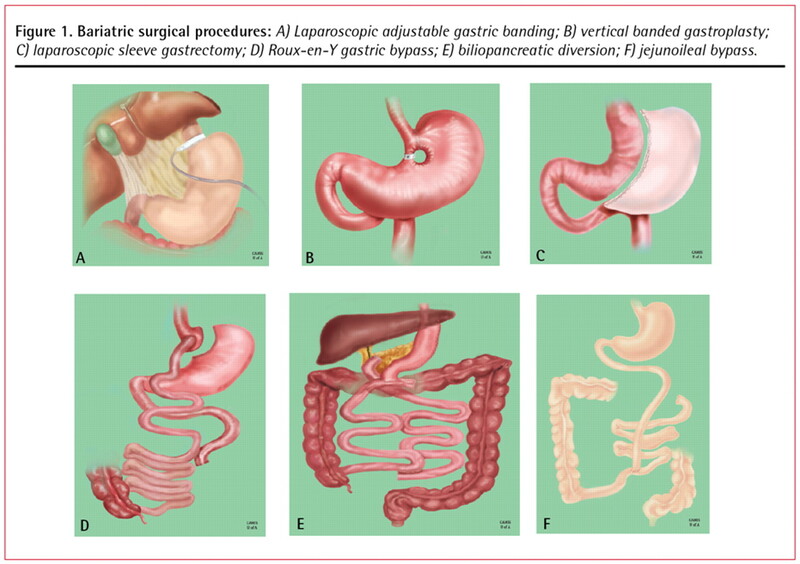 Bariatric surgical procedures: A) Laparoscopic adjustable gastric banding; B) vertical banded gastroplasty; C) laparoscopic sleeve gastrectomy; D) Roux-en-Y gastric bypass; E) biliopancreatic diversion; F) jejunoileal bypass. Vertical banded gastroplasty (Figure 1B): This operation involves stapling the stomach, front to back, below the gastroesophageal junction and 1 cm from the lesser curvature. A vertical staple line is then made from the opening to the left side of the gastroesophageal junction, and the outlet stoma is restricted with a 1-cm diameter polypropylene band.12 The band mechanically restricts food intake, creating an early sense of satiety that limits intake. Because of the higher-than-expected complication rate, vertical banded gastroplasty is no longer routinely performed. Laparoscopic sleeve gastrectomy (LSG) (Figure 1C): Rather than a pouch, this procedure creates a “sleeve” of the stomach, extending from the esophagus to the duodenum. The size of the gastric sleeve is approximately 60 to 120 mL. The gastric remnant, approximately 80% of the stomach, is removed. Production of ghrelin, a hormone involved in appetite, is reduced, resulting in decreased hunger and improved satiety.13 Sleeve gastrectomy remains an investigational procedure in our institute (ie, University of Alberta) to determine safety and long-term outcomes. Roux-en-Y gastric bypass (RYGB) (Figure 1D): Roux-en-Y gastric bypass involves construction of a small (30 mL) proximal gastric pouch by stapling and dividing the stomach. The pouch empties into a segment of the jejunum that is brought up to the gastric pouch as a Roux-en-Y limb. Although the gastric bypass is considered a restrictive procedure, it causes some malabsorption as a consequence of the bypassed stomach, duodenum, and upper jejunum. Malabsorptive procedures decrease absorption of nutrients by decreasing the length of small intestine that is exposed to food. Malabsorptive procedures produce substantial weight loss but also have the highest complication rates. There is approximately a 3.1% incidence of bleeding after bariatric surgery.18 Twenty-two percent of bleeds stop spontaneously, 55% necessitate blood transfusion, and 22% require operative intervention.18 Active bleeding often presents within 6 hours of the operative intervention and manifests with bright red bleeding orally, rectally, or abdominally, with possible hypotension and tachycardia. Prompt surgical or endoscopic intervention is required. Delayed bleeding often presents several days postoperatively with dark blood either within surgical drains or passed orally or rectally. Delayed bleeding often does not present with symptoms of hemodynamic instability, and the physician can pursue diagnostic maneuvers such as radiologic, hematologic, and endoscopic evaluation. Excess or loose skin: Excess or loose skin is a common, unwanted side effect of substantial weight loss. Mobility and self-care might be impaired. Infection and ulcerations might develop. Referral to a bariatric physician or occupational or physical therapist is recommended. Small bowel obstruction: Small bowel obstruction might present as abdominal bloating, cramping, or pain and nausea to severe pain and emesis. It might be due to adhesions, internal hernias, or severe constipation. Erosion or slippage of the band: Erosion or slippage of the band might occur. Patients might present with symptoms of proximal gastric outlet obstruction (eg, dysphagia, nausea, vomiting, inability to tolerate solid food, or abdominal pain or discomfort) with possible excessive weight loss. Referral to a bariatric surgeon is recommended. Leakage from port or band tubing (with LAGB): Patients report feelings of fullness or satiety initially after a fill, but complete loss of this sensation and a substantial increase in volume of solid food tolerated occurs within a few days. Weight regain or poor weight-loss outcome might occur. Anastomotic stricture: Anastomotic stricture might occur during healing as scar tissue develops. Strictures might be suspected if a recent surgical patient (ie, RYGB) who had previously been tolerating oral intake now reports consistent and progressive nausea and vomiting with solid foods and is able to tolerate only small amounts of liquids at a time. Referral to a registered dietitian and bariatric surgeon is recommended. Gastrogastric fistulae: Gastrogastric fistulae might develop owing to failure or incomplete staple partition of the pouch.14 Patients might present with tolerance of high volumes of solid food, lack of restriction, lack of satiety, tolerance to textures commonly difficult after bariatric procedures (eg, sticky, doughy, stringy, tough), and either weight regain or poor weight-loss outcome. Referral to a bariatric surgeon is recommended. Dumping syndrome: Dumping syndrome occurs when food enters the small intestine, bypassing the stomach. Dumping syndrome can occur after bariatric surgery for combined or primary malabsorptive procedures. Early symptoms (within 30 minutes after eating) occur when food and fluid pass into the small intestine too fast. Symptoms might include nausea, vomiting, stomach pain or cramping, diarrhea, feelings of fullness or bloating, or increased heart rate. Late symptoms (1 to 3 hours after eating) occur when there are changes in the amounts of insulin and sugar in the blood (ie, reactive hypoglycemia). Late symptoms might also include flushing or sweating, intense need to lie down, feeling weak or dizzy, feeling nervous or shaky, or a drop in blood pressure. Outcomes after bariatric surgery are often reported as the percentage of excess weight lost (EWL). Excess weight is the total amount of weight above a reference standard for “ideal” weight (ie, BMI of 24.9 kg/m2). Table 115,20–25 summarizes the literature reports on weight loss after each option for bariatric surgery. Weight-loss outcomes (ie, percentage of EWL) might not be significantly different at 5 years or more after surgery, regardless of the procedure. The weight-loss targets after bariatric surgery are not to achieve a “normal” weight based on height and weight reference tables or BMI ranges. The most important outcomes are resolution of comorbid conditions and improvement in quality of life. Up to 30% of people who have bariatric surgery might experience substantial weight regain. Box 2 presents several factors that can contribute to weight increase. It is important to continue interventions including nutrition and activity counseling, behaviour modification, and medical management, as surgical treatment alone is not successful. Weight regain might be related to technical failures of the surgery and should be reassessed by the bariatric surgeon. LAGB—laparoscopic adjustable gastric banding, RYGB—Roux-en-Y gastric bypass. All bariatric patients are assessed by the surgeon 3 weeks after surgery to assess surgical wound healing and to rule out immediate postoperative complications (eg, abscess, infection, hernia). Thereafter, surgeon visits are scheduled every month for LAGB patients for band fills and every 3 months for RYGB and LSG patients (Table 2). Each visit focuses on weight loss and comorbidity resolution. Furthermore, close attention is paid to determining changes in blood pressure, blood glucose levels, and mental health. The registered dietitian sees all patients at 6 weeks, 3 months, and then every 3 months for the first year. Each visit includes a thorough assessment of caloric and protein intake and an overall nutritional assessment. Bloodwork (ie, complete blood count with differential, electrolytes, fasting blood glucose, hemoglobin A1c, fasting lipid panel, creatinine, urea, albumin, alanine aminotransferase, bilirubin, ferritin, vitamin B12, 25-hydroxyvitamin D, parathyroid hormone, calcium) is ordered at 3 months, 6 months, 1 year, and 18 months for RYGB and LSG patients. Laparoscopic adjustable gastric banding patients have the same bloodwork drawn at 6 months and 1 year. Annual bloodwork is then ordered on all patients thereafter. Follow-up in our centre is lifelong, but visits with the surgeon and the registered dietitian are spread out to every 6 months after the first year. Patients should follow a well-balanced, calorie-reduced diet as part of a comprehensive weight management strategy. Box 334 shows some nutritional recommendations after bariatric surgery. Vitamin and mineral supplementation is recommended for all restrictive procedures and is a lifelong requirement for combined or malabsorptive procedures. Bloodwork is recommended to detect and monitor for vitamin and mineral deficiencies with attention to iron (ie, complete blood count with differential, ferritin, iron, total iron-binding capacity, and percent of oxygen saturation), folic acid (folate), bone health (25-hydroxyvitamin D, calcium, and parathyroid hormone), and vitamin B12. Referral to a registered dietitian for nutrition counseling and supplementation is recommended. The commonly held belief that obese individuals can lose weight by simply “eating less and moving more” is flawed and not supported by the literature.6 Bariatric surgery should be considered for patients who have not achieved adequate weight loss with lifestyle and medical management who are at high risk of morbidity and mortality, and who are suffering from the complications of obesity. Success with bariatric surgery is more likely when multidisciplinary health care providers, in conjunction with primary health care providers, assess, treat, monitor, and evaluate individuals both before and after surgery.4,6,7,9 Family physicians should use the expertise of their multidisciplinary care team to promote and manage the health of their bariatric surgical patients. Further information that outlines procedures offered and referral methods can be obtained from the Canadian Obesity Network (www.obesitynetwork.ca) and the Canadian Association of Bariatric Physicians and Surgeons (www.cabps.ca). The rising incidence of obesity, as well as the increasing number of those who have undergone bariatric procedures, will lead to more family physicians seeing more patients with questions about bariatric surgery. Lifestyle change is critical to success following surgery, and patients will require lifelong support to achieve this. A high index of suspicion is essential when abdominal pain, nausea, or vomiting occur in patients who have had bariatric surgery. Referral to an obesity clinic is recommended. Patients must remain on the recommended supplements for a lifetime. Routine laboratory assessment is essential to determine nutritional status. Compte tenu de l’augmentation de l’incidence de l’obésité et du nombre croissant de personnes ayant subi une intervention bariatrique, les médecins de famille auront de plus en plus à répondre à des questions au sujet de ces interventions. Un changement du mode de vie est essentiel pour que ces interventions réussissent, et les patients auront besoin de support toute leur vie pour y arriver. Il y a lieu d’être extrêmement attentif chez un patient qui présente douleur abdominale, nausées ou vomissements après une intervention bariatrique. Un tel patient devra être dirigé à une clinique d’obésité. Les patients doivent respecter les suppléments recommandés pour le reste de leur vie. Des examens de laboratoire doivent aussi être faits régulièrement pour vérifier leur état nutritionnel. All authors contributed to the literature search and preparation of the article for submission. ; Statistics Canada. Nutrition: findings from the Canadian Community Health Survey. Ottawa, ON: Statistics Canada; 2005. Measured obesity. Overweight Canadian children and adolescents. Catalogue No. 82-620-MWE2005001. Available from: www.statcan.ca/english/research/82-620-MIE/2005001/pdf/cobesity.pdf. Accessed 2010 Jul 26.
. Temporal trends in overweight and obesity in Canada, 1981–1996. Int J Obes Relat Metab Disord 2002;26(4):538-43.
. Prevalence of overweight and obesity in provincial population of Canadian preschool children. CMAJ 2004;171(3):240-2.
. 2006 Canadian clinical practice guidelines on the management and prevention of obesity in adults and children. CMAJ 2007;176(8):S1-13.
. Characteristics of patients undergoing bariatric surgery in Canada. Obes Res 2005;13(12):2052-4. Gastrointestinal surgery for severe obesity: National Institutes of Health consensus development conference statement. Am J Clin Nutr 1992;55(2 Suppl):615S-9.
. Gastrointestinal surgery for severe obesity. Consensus development conference panel. Ann Intern Med 1991;115(12):956-61.
. Clinical guidelines on the identification, evaluation, and treatment of overweight and obesity in adults. The evidence report. Bethesda, MD: National Institutes of Health; 1998. Available from: www.nhlbi.nih.gov/guidelines/obesity/ob_gdlns.pdf. Accessed 2010 Jul 26.
. American Association of Clinical Endocrinologists, The Obesity Society, and American Society for Metabolic & Bariatric Surgery medical guidelines for the clinical practice for the perioperative nutritional, metabolic and nonsurgical support of the bariatric surgery patient. Surg Obes Relat Dis 2008;4(5 Suppl):S109-84.
. Early mortality among Medicare beneficiaries undergoing bariatric surgical procedures. JAMA 2005;294(15):1903-8.
. Surgical treatment of obesity. In: Bray GH, Bouchard C, James WP, editors. Handbook of obesity. New York, NY: Marcel Dekker; 1997. p. 977-85.
. Vertical banded gastroplasty for obesity. Arch Surg 1982;117(5):701-6.
. Mid-term follow-up after sleeve gastrectomy as a final approach for morbid obesity. Obes Surg 2009;19(5):544-8. Epub 2009 Mar 12.
. Surgery for morbid obesity. Cochrane Database Syst Rev 2005;(4):CD003641. DOI:10.1002/14651858.CD003641.pub2.
. Lifestyle, diabetes, and cardiovascular risk factors 10 years after bariatric surgery. N Engl J Med 2004;351(26):2683-93.
. Small bowel obstruction and internal hernias after laparoscopic Roux-en-Y gastric bypass. Obes Surg 2003;13(4):596-600.
. Laparoscopic management of complications following laparoscopic Roux-en-Y gastric bypass for morbid obesity. Surg Endosc 2003;17(4):610-4. Epub 2003 Feb 17.
. Bleeding after laparoscopic gastric bypass: case report and literature review. Surg Obes Relat Dis 2005;1(2):99-103.
. Weight loss after laparoscopic adjustable gastric banding is not caused by altered gastric emptying. Obes Surg 2009;19(3):287-92. Epub 2008 Oct 21.
. Revisional bariatric surgery. Obes Surg 2009;19(7):827-32. Epub 2008 Oct 30.
. Managing obesity. A clinical guide. Chicago, IL: American Dietetic Association; 2004.
. Obesity surgery: evidence for diabetes prevention/management. J Am Diet Assoc 2008;108(4 Suppl 1):S40-4.
. Predictors of weight loss in bariatric patients at the Ohio State University. J Am Diet Assoc 2007;107(8 Suppl 3):A84.
. Position of the American Dietetic Association: weight management. J Am Diet Assoc 2009;109(2):330-46.
. Improvement in heart disease risk factors after gastric bypass. Arch Surg 1983;118(6):681-4.
. Who would have thought it? An operation proves to be the most effective therapy for adult-onset diabetes mellitus. Ann Surg 1995;222(3):339-50.
. Bariatric surgery: a systematic review and meta-analysis. JAMA 2004;292(14):1724-37.
. The effect of surgical weight reduction on sleep quality in obesity-related sleep apnea syndrome. Surgery 1985;97(5):535-8.
. Hemodynamic dysfunction in obesity hypoventilation syndrome and the effects of treatment with surgically induced weight loss. Ann Surg 1988;207(5):604-13.
. The effect of gastric bypass surgery on hypertension in morbidly obese patients. Arch Intern Med 1994;154(2):193-200.
. Roux-Y gastric bypass: an effective anti-reflux procedure. Obes Surg 1991;1(3):295-8.
. Symptomatic and clinical improvement in morbidly obese patients with gastroesophageal reflux disease following Roux-en-Y gastric bypass. Obes Surg 1997;7(6):479-84.
. Short-term effects of sleeve gastrectomy on type 2 diabetes mellitus in severely obese subjects. Obes Surg 2007;17(8):1069-74.
. ASMBS guidelines: ASMBS Allied Health nutritional guidelines for the surgical weight loss patient. Surg Obes Relat Dis 2008;4(5 Suppl):S73-108. Epub 2008 May 19.